The Electromotive Diesel Locomotives (EMD) are supposed to have extremely delightful looks in their Long hood Front Mode. Though there are technical difficulties while driving in Long Hood Front Mode, the looks of the Magestic Electromotive Diesels are Most Stunning and Impressive in their Long Hood Front Mode. 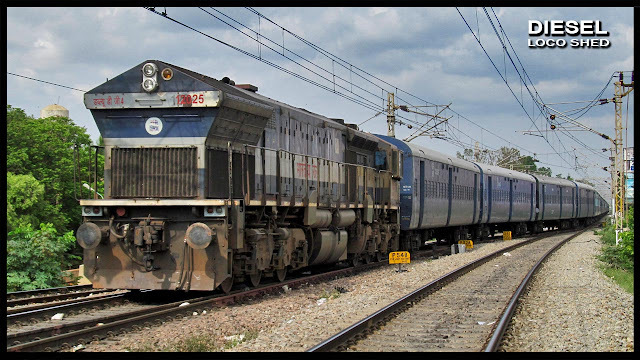 The EMD Locomotives of Indian Railways always impress the viewers the most in their Long Hood Front Mode. Diesel Loco Shed, hereby presents a few pictures and videos of the Electromotive Diesels of Indian Railways, in their Impressive Long Hood Front Mode. "The Very First WDG 4 Locomotive to enter Indian Railways in his Elegant Long Hood Front"
WDG 4 / 12001, homed at Diesel Loco Shed, Hubballi, is the very first WDG 4 Class Locomotive of Indian Railways. Seen in this Picture, is 12001 hauling 06512 / Jaipur Yesvantapur Garib Rath Special towards the Last leg of the Journey. 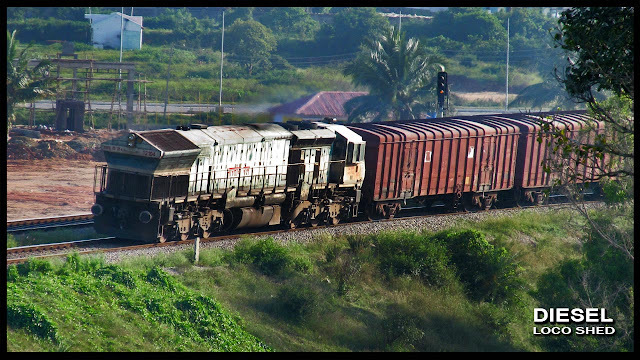 "The Fourth WDG 4 of Indian Railways in Long Hood Front Mode"
WDG 4 / 12004, also homed at Diesel Loco Shed, Hubballi, has one of the Most Magnificent Looks, especially in his Long Hood Front Mode. 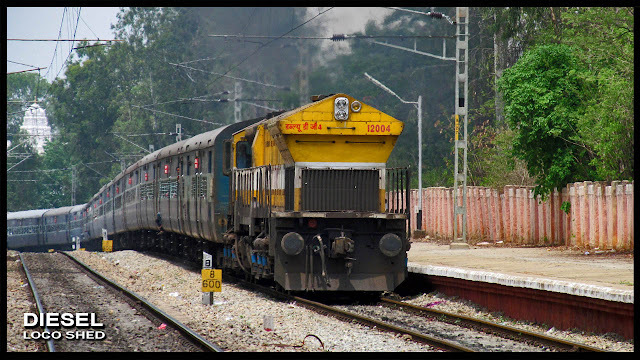 Popularly known as the "Golden EMD" or the "Mango EMD", 12004 has always appeared pleasing and charming to the viewers. 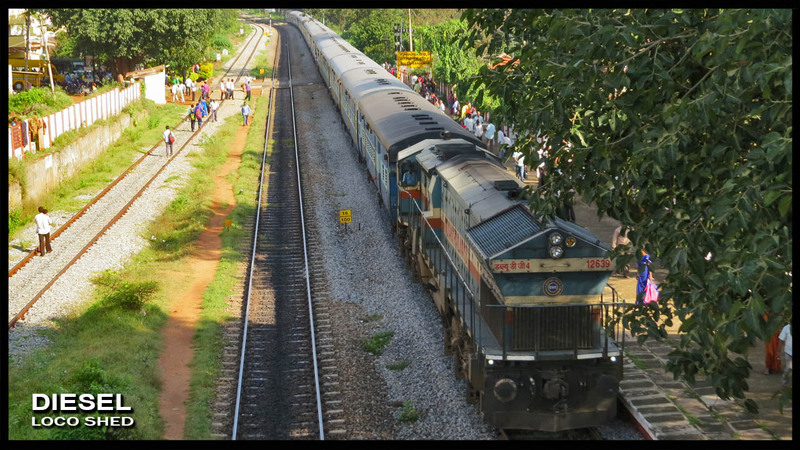 Seen in this Picture is 12004 hauling 12613 / Mysuru Bengaluru Tippu Superfast Express across the gradients of South Western Railways. "12025 hauls a Long Rake of Parcel Vans"
WDG 4 / 12025, also from Diesel Loco Shed, Hubballi, hauling a long rake of Parcel Vans, Single handedly. The Dark Purple Livery of this Locomotive gives yet another Mesmerizing Look in the Long Hood Front Mode. 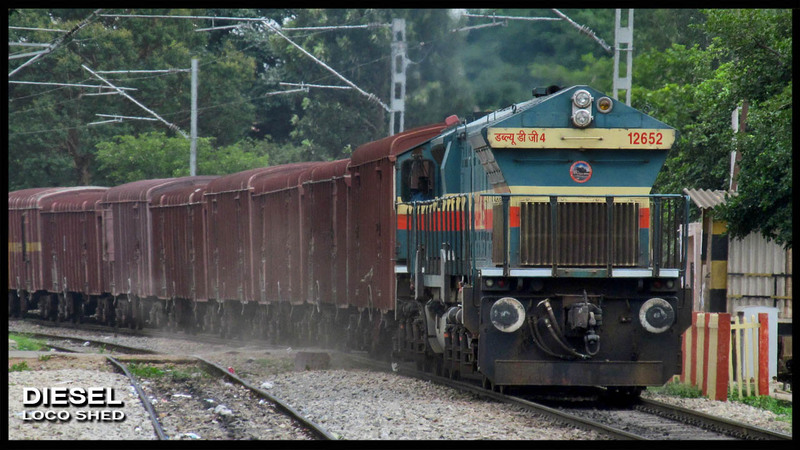 "PUNE WDG 4 Multiple Unit with Lead Locomotive in LONG HOOD FRONT Mode !! " 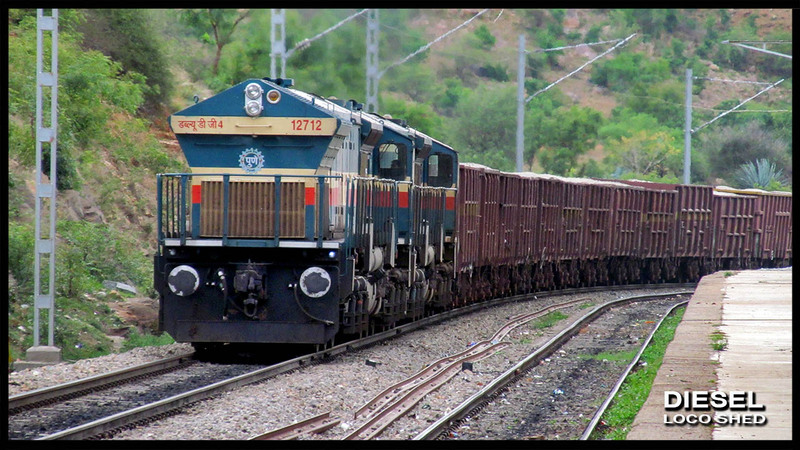 WDG 4 / 12712, from Diesel Loco Shed, PUNE as a part of the Multiple Unit with his Shed Mate, Leads a BOXN Wagon. Usually Multiple units will have Short hood Leading on both the sides, while this is a rare case where in the Lead Locomotive is in Long Hood Front Mode. "A Light Green Liveried WDG 4 with a BCNA Freight Rake"
WDG 4 / 12104, from Diesel Loco Shed, Hubballi can be seen hauling a BCNA Freight Rake. "GOC WDG 4 powering a Freight Rake Single Handedly"
WDG 4 / 12652, from Diesel Loco Shed, GOC (Ponmalai) powers a BCNA Freight Rake. "KJM WDG 4 powering Intercity Express"
WDG 4 / 12639, from Diesel Loco Shed, Krishnarajapuram can be seen powering 16202 / Shivamogga Town Bengaluru City INTERCITY Express. 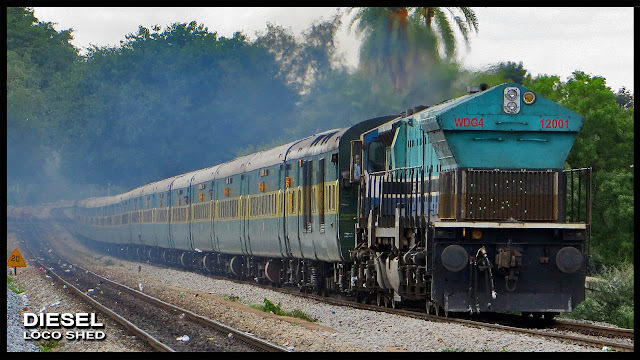 The Very First WDG 4 of Indian Railways, hauls JP YPR Garib Rath Special in his Elegant Long Hood Front mode !! WDG 4 from Diesel Loco Shed, Izzatnagar hauls Yesvantpur Tatanagar Express, also in Long Hood Front Mode !! The 4th WDG 4 powers UDYAN Express !! I think this loco is not comfortable for the pilot because of their (1) longness (long length) and (2)Obstruction view by the hood to pilot. What do you think? The MAGIC OF Twin Single Line !! Best Ever Parallel Action !! The "SULTAN" of Our EMPIRE with the LEGEND of the SOUTH !! The Latest Allotment - WDG 5, 50004 !!! The Legendary DHULGHAT Spiral ! !